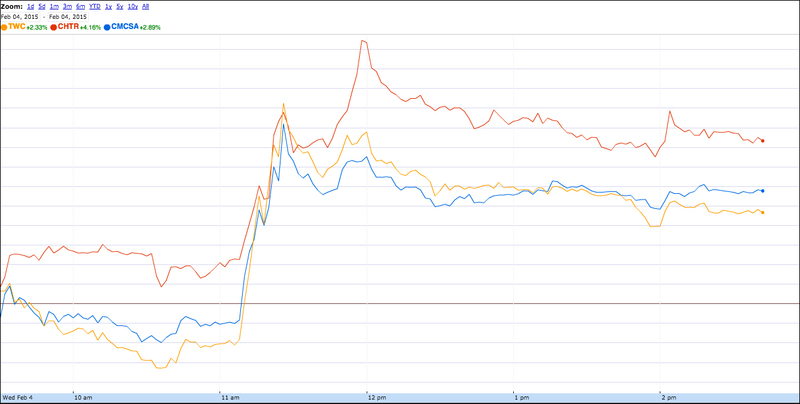 Stock price changes for Comcast, TWC, and Charter, as seen on Google Finance on February 4, 2015. All jumped significantly after FCC chair Tom Wheeler’s op-ed about net neutrality hit the internet at 11:00 a.m. The stocks all went up. Bloomberg reports today that pretty much all the major ISPs, including Comcast, Verizon, AT&T, Time Warner Cable, Charter, and Cablevision, all saw at least modest gains during the hours immediately following Wheeler’s announcement. Comcast, TWC, and Charter all particularly benefited, seeing gains of as much as of 4.6%, 5.2%, and 6.9% respectively. So if regulation in all its forms is supposed to be bad for business, what’s fueling these gains? Bloomberg quotes an analyst who theorizes that forbearance is working its magic. Specifically: Title II could allow the FCC to impose rate controls on ISPs, and big business — and its investors — had been skittish about that possibility. But now with the outline (PDF) of the proposal available, investors can see that the FCC is steering well clear of rate regulation and changes in fees or taxes. In other words, investors are happy because cable companies can continue to charge you as much as they darn well please. They just can’t throttle your content while they’re doing it.